"We make T Shirts people WANT to wear!" Do you need fast custom t shirt screenprinting in Mcallen? Then you are in luck, give us a call to 956-580-4488. Welcome to T Shirt Factory. We are a team ready to serve your needs... Whether you need screenprinting Mcallen Tx, ﻿ t shirt printing, banners or signs, embroidery, or promotional products. We are your One Stop Shop. We will come through for you with flying colors. We specialize in what we do, and we take great pride and it shows....We do T shirt printing for the following local cities, La Joya, Palmview, Mission, Mcallen, Edinburg, Pharr San Juan, Alamo, Weslaco, Edcouch, Progreso, San Benito, Harlingen, Brownsville and many others. Custom embroidery in Mcallen Tx. Ordering T Shirts from us, is as easy as 1, 2, 3! Need T Shirt Screen Printing fast? Bulk T shirt Screen printing orders come into play if you are in need of Custom printed t shirts for your organization event, clothing line, fundraiser, or business. This is for any groups, organizations in any industry who would like for us to do their bulk t shirt orders. We are equipped with automatic screen printing presses that allow us to print hundreds of items per hour, resulting in an affordable per-piece cost. We are also happy to offer complimentary design services for your events or fundraisers at no additional cost for those that qualify. To see if you qualify for Wholesale Prices, please email or call Customer Service today. How do I manage to offer such cheap pricing for great custom screen printed shirts? We operate out of South Texas, we have very cheap labor and take full advantage of this fact, by passing on the great prices to our customers, and getting more business. If you have any questions or concerns, please contact us or call to 956.624. 9945 for more info from Wikipedia click here. Difference between Successful, Thriving business and those that fail is..... Marketing!! We are business people that know decorated apparel is the best way to advertise. I would like to share a secret with you. First let me ask, Do you know the easiest and most powerful way to promote your business? A T-shirt! Yes it's true. 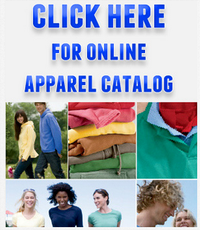 A t-shirt or anything with your logo is a walking advertising billboard! Give me a call and lets talk on how I can help with your cheap t shirts screen printing or embroidery. 956.580.4488. The simple answer to that question is, of course, Visibility. Promotional screen printed t shirts turn people into your own corporate walking billboards. T shirt scan potentially turn your customers into a horde of living advertisements in their own right! Not only do promotional screen printed t shirts give your business and brand great exposure, they also make you look good in the eyes of the customers who receive them. giving you a very inexpensive form of mass marketing that, depending on the quality of the materials, could continue ... working for you for a long time after the initial investment! 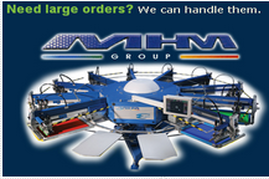 Frustrated with expensive local screen printers for your customized t-shirt needs? Cheap t shirt printing with unparalleled quality is a click away with T Shirt Factory. You can design your own t-shirt with ease - Just email us an idea of your artwork, and once we secure a deposit of usually 50% our very talented design team will get busy creating and ordering your t shirts in just days. Our team gives you the ability to preview what your screen printed t-shirt will look like, and our service team is available seven days a week to help you; they'll even make suggestions on how to keep your order costs down. An expert artist reviews every order, ensuring that your t shirt screen printing looks awesome. We offer a money-back guarantee, and our standard free shipping means your order will arrive within 14 days. We have a rush service with delivery in 7 days. 3- Within a few days you will get a virtual t-shirt, this is an email that has a digital picture of your t-shirt or in another word your proof, please review it carefully and make sure that the colors, spelling and placement are exactly how you want them. Once you approve your virtual t-shirt we will print your custom t-shirts and ship them to your location. *1) You call us so we can help you with artwork , shirt style, order amount, colors, etc. and prices. *2) We email you artwork, you verify artwork, or let us know if any changes are to be made. *3) After artwork has been completed and verified we get to printing or embroidery on your shirts. *4) Your products are then professionally printed using the highest quality, longest lasting inks available. 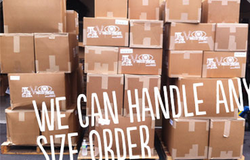 *5) We pack them up, print a label, and ship them directly to your door. *6) You then tell us how happy you are with your order and email us a testimonial and you become a lifetime customer. Although we are located in the RGV, Rio Grande Valley, we proudly screen print for all cities all over the United States. We proudly provide t shirt printing for the following cities include Mission, La Joya, Rio Grande City, Roma, Palmview, Palmhurst, Sharyland, Mcallen, Pharr, San Juan, Alamo, Donna, Edinburg, Edcouch, Weslaco, Harlingen, Brownsville. PI ordered shirts from Vanessa and they turned out fabulous! We are very pleased our order and the screenprinting service T Shirt Factory provides. I will be referring you to all my friends!! T Shirt Factory is by far the best place to have shirts made! I appreciate you and your company's fast response times to email inquiries. I have tried to work with at least 3 other shirt printing companies who were either slow to respond or non-responsive at all. It diminishes my confidence in doing business with them, but I'm glad to see Sports Locker operates this way. Awesome job on the EVERY child shirts for Joseph's Hope Foundation. Can't wait to work with them on a project for our golf tournament fundraiser. Thank you so much! The shirts turned out excellent, couldn't be happier with my shirts :). I just picked up my first order from you guys and it is fabulous!! I'm completely satisfied with how your company took my design and brought it into being. Thanks. I've already placed my next order and I can see many more coming in the future. I cannot tell you how much we appreciate the expeditious manner in which you and your team produced and shipped these shirts (especially in light of the fact that it was the holiday season). Sports Locker is a class act, and you have earned our chapter's business from now on. Not only does Sports Locker offer quality product at fair prices, but the Customer Service is SUPERB! That is definitely hard to find in 2011!! Wanted to thank you for all your help through out this process. You have been very helpfull... I wish every representative out in the world was a good as you on their job. Rick -- that is absolutely phenomenal! I deeply appreciate your help and ask that you thank your printers for me as well. I will certainly be a repeat customer and will encourage others to use you guys as well. T Shirt Factory rocks! I've ordered many times for TEAM HOPE, a group supporting two of our friends recently diagnosed with cancer and they present quality products within the time frame provided. I'd do business with them anytime! The shirts arrived today and they look great!!! We'll be ordering again soon. Our tees arrived just in time for our Family Reunion Party and they were terrific! Everyone loved them, thank you so much. Received shirts on the day indicated, great quality! Thanks! We received the order-they look incredible! We can't wait to order more next week!! I just received my company's shirt order and I'd like to say that you all more than exceeded our expectations! They look absolutely fabulous, and you did a fantastic job even down to the smallest detailing. I don't think there is a better company around and honestly, what a deal for such quality printing. We plan to order more of these shirts and are already working on our next design! Thanks again! Rick worked very diligently to get our T-shirts done in a short time and the outcome was fantastic. Everyone in our organization was very pleased with the artwork . We will be using Sports Locker for future orders. We received our order yesterday & I absolutely LOVE them!! Thanks! We just received our order and everything looks great. You guys do a terrific job. Will continue to use Sports Locker for all our business! I just received my order and its looks awesome! Thank you Rick! We will be ordering again! We received our order today and shirts look great! Thanks T Shirt Factory! We ordered shirts for our family vacation. Everyone loved the shirts! Thanks T Shirt Factory!